The ambience in an eating establishment is one of the things customers keep coming back for. It takes the dining experience to new heights. In fact, it’s one of the first things that attract customers. Character-themed eating establishments might be too juvenile for some people but we’d all be hypocrites to say that they don’t catch our fancy! Everyone has been a child and everyone is still a child at heart. So, what are you waiting for? 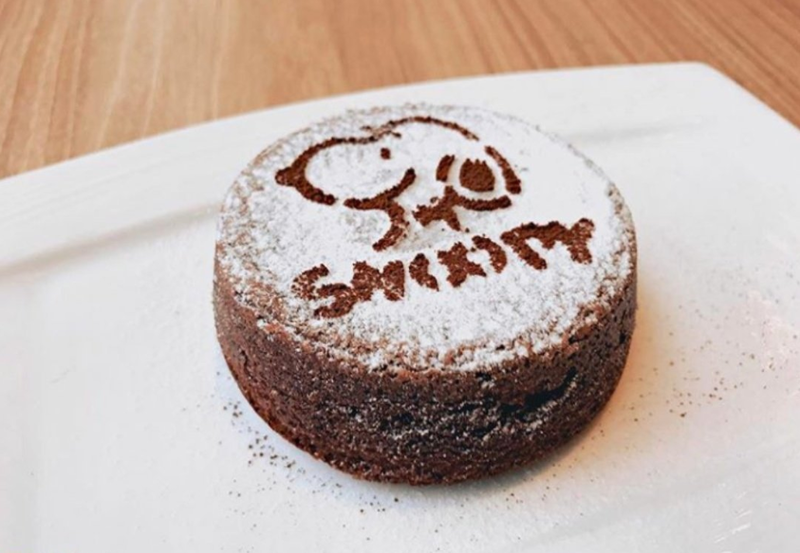 Bring along your family and friends, indulge in your favorite food, feast your eyes and have a great time hanging out in these cartoon-themed cafés. 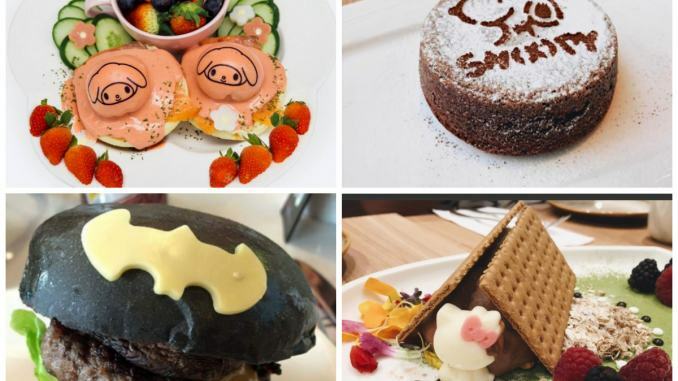 There’s no reason why you wouldn’t enjoy the food and hang out in these cute cartoon-themed cafes. Everyone in the world knows the wide, innocent, questioning face of this cat from Japan. She’s so adorable that she’s Japan’s tourism ambassador to China and Hong Kong. 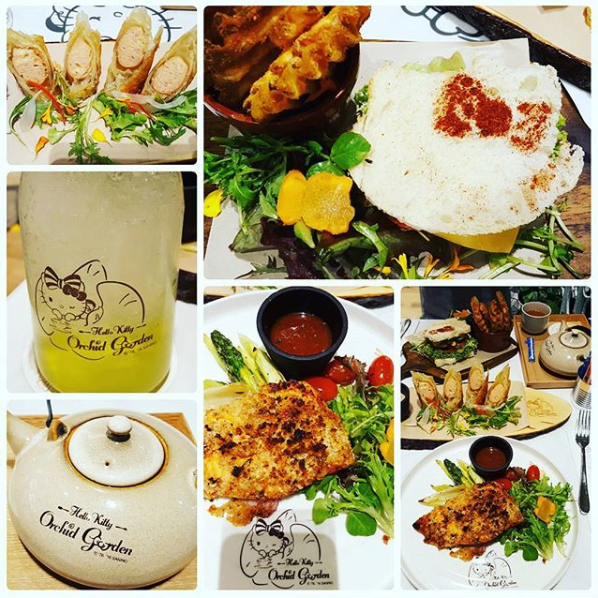 The Hello Kitty Orchid Garden Café at Changi Airport, Terminal 3, houses a luscious garden with opulent orchids (Singapore’s national flower) set in an elaborately rustic setting. It also has a retail section where you can buy Hello Kitty merchandise, a must for every Hello Kitty lover. The café is open 24 hours. 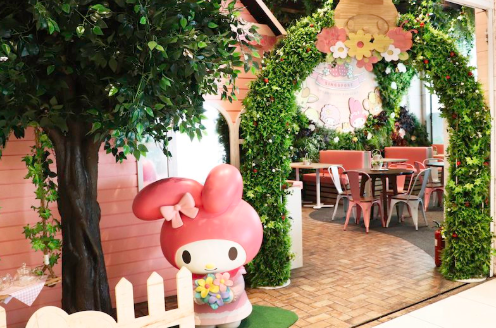 This eating establishment seats 84 people on its Hello Kitty-shaped furniture. 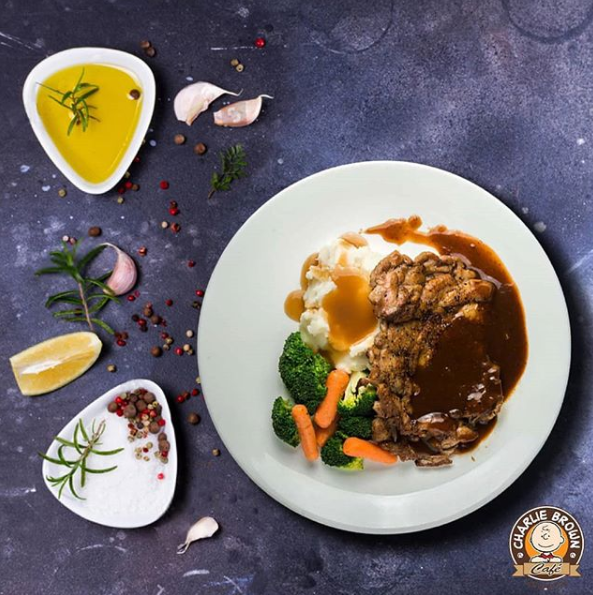 The café’s extensive menu ranges from waffles to salad, and wagyu beef rendang to orange sugee cake. 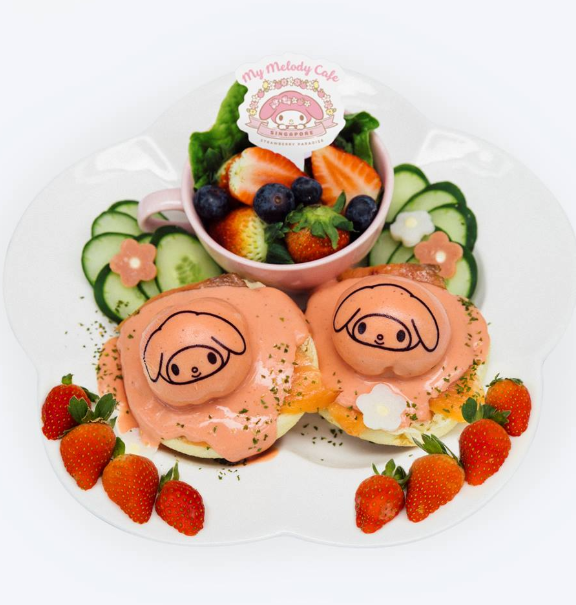 Their breakfast menu has Eggs Benedict with smoked duck and salmon among many others, that pairs perfectly with their Hello Kitty custom-roasted coffee and custom-blended tea. Their amazing choices in their gourmet coffee include: Ice Salted Caramel Latte, Affogato, Espresso, Latte, T3 Blend Coffee, Ice Speculoos Latte, Flat White, Café Mocha and Capuccino. Not to get left behind with teas, Hello Kitty Orchid Garden Café offers: Kitty’s Apple Pie Tea, Strawberry Marshmallow Tea, British Breakfast Tea and Earl Grey goes Tokyo Tea. It has any food imaginable for large groups, friends and colleagues and family gatherings. Food prices range from S$15 to S$24. Another beloved Sanrio character accompanying Hello Kitty in Singapore, is the good-natured rabbit with pink ears, My Melody. My Melody Café in Suntec City Mall, has pink as the predominant color. You’ll be greeted by a floral arch opening up to the café’s relaxing cottage house ambience. Open from 10 a.m. to 10 p.m. from Monday to Sunday, you can choose from their 5 main meals, 6 desserts and 7 My Melody beverages. Little Pink Riding Hood (S$23.90) – Picnic ham blankets smoked salmon in this dish. It’s got poached eggs with hollandaise sauce served with fruit salad and Japanese cucumbers. Hola Taco (S$25) – Bulgogi beef and tacos with romaine lettuce, tropical salsa and berries. Pancake Bliss (S$23) – Made with buttermilk, it goes well with the café’s grilled chicken caesar with mentaiko dressing. The dish is completed with broccoli, picnic ham, asparagus and mixed berries. 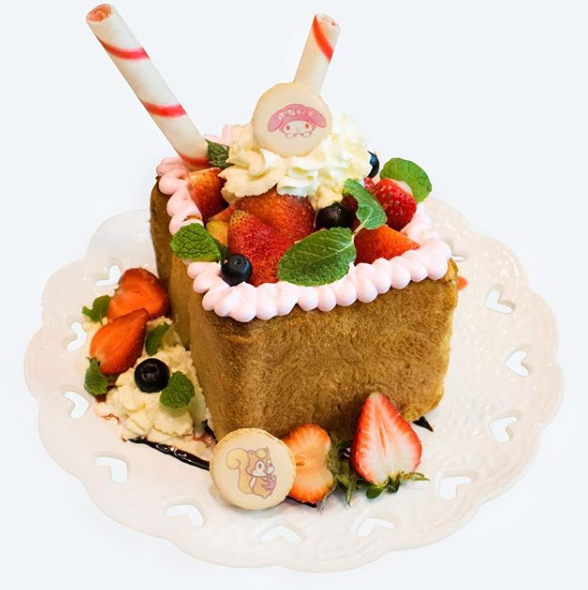 Treasures of Maryland (S$19.50) – Brioche toast dressed up with strawberries, strawberry sticks, vanilla soft serve and and My Melody macaroons. Play Time Fondue (S$22.50) – Pink chocolate fondue with strawberries, butter cookies, vanilla sponge cakes and heart-shaped marshmallows. Everyone is a fan of superheroes. Science says that as babies, we’re all wired to recognize actions that protect the weak. Thus, superheroes are characters we’re all drawn to. So, no one, male or female, can ever go wrong hanging out and dining at DC Comics Super Heroes Café. Recreations of posters from DC Comics series are found all around. Booths also have varying themes: Wonder Woman, Supergirl, Green Lantern and The Flash. Found on the first level of The Shoppes at Marina Bay Sands, get ready to feast your eyes and stomach to American-style steaks, burgers and sandwiches. 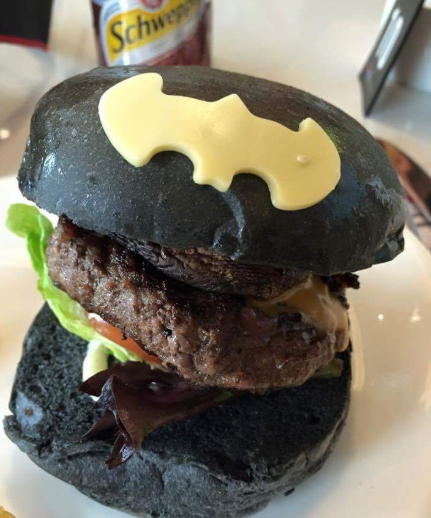 The café’s signature dish is the wagyu beef and foie gras butter in a charcoal burger bun with the Batman logo. Prices range from S$20 to S$40. The world got to know the bald little boy Charlie Brown and his pet beagle Snoopy, together with the rest of the Peanuts characters at a time when there was fear and loathing in the world. The harmless, good-natured team became popular a few months after US President Kennedy was assassinated in the 60s and thus became a symbol of a start of a new life and hope for many. 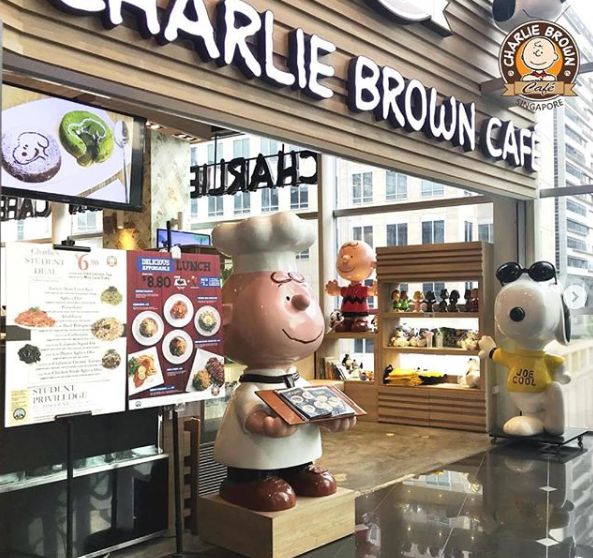 Charlie Brown Café in Singapore is South-east Asia’s first Peanuts comic strip themed-cafe. Its first outlet in Orchard Cineleisure Mall opened in 2011. The OneKM mall outlet opened in 2015. 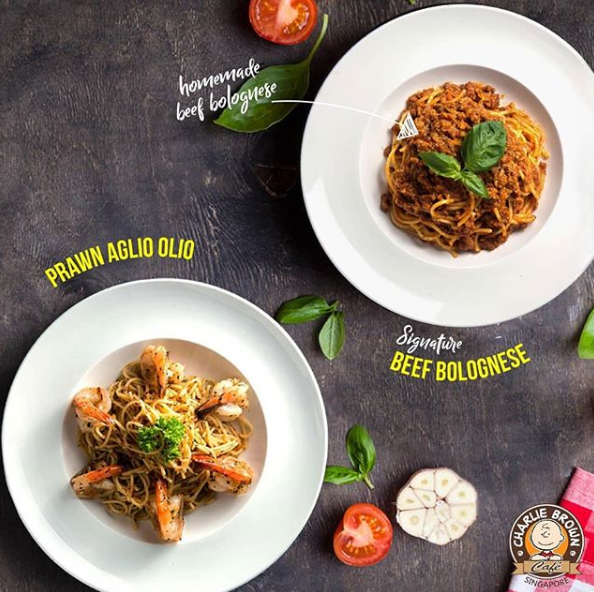 Both cafés are Halal-certified and are known to offer some of the best Western cuisines in Singapore. You can never go wrong with their signature Honey Grilled Chicken (S$14) and the Beef Risotto (S$14). For dessert, enjoy the chocolate and matcha lava cakes ($7). You can take home cute Peanuts merchandise as a souvenir. Who doesn’t love Harry Potter? To those who don’t, they might not have yet seen the movie, read the book or read about a great put-together review. It’s not just about the magic. Anyone knows if there’s nothing substantial in any book, movie or character and there’s magic involved, then magic is to blame for the tackiness. Not with Harry Potter. The tons of life lessons in all Harry Potter books and movies is enough for even grown-ups to love him. 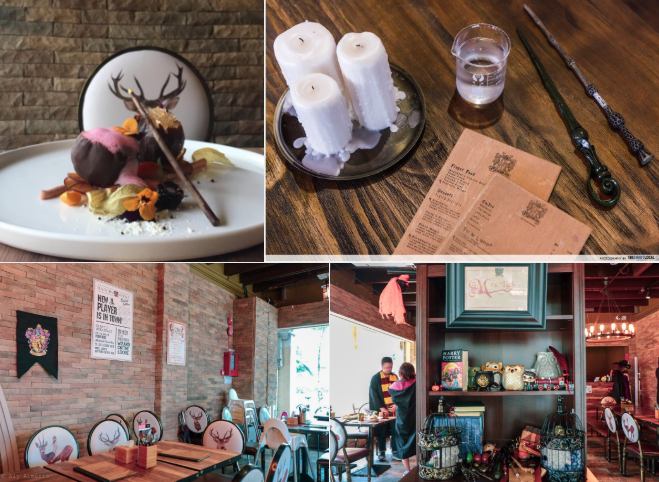 Paying tribute to this amazing young wizard is Platform 1094 through their wizard-themed café in Serangoon Road. 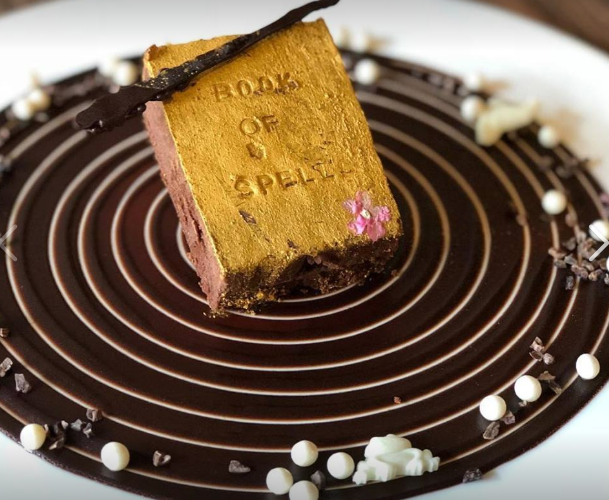 The café’s English afternoon tea that’s priced at S$55 has a selection of sweets: Chocolate Frogs, Owl Hootdoo Macaroons and Turkey Bacon Quiddithch Quiche – all inspired by the Harry Potter series, of course. This menu is reservation-based and is available only from Tuesdays to Sundays between 2 p.m. to 6 p.m.